CakePHP is a modern PHP 5.4+ framework with a flexible Database access layer and a powerful scaffolding system that makes building both small and complex systems a breeze. CakePHP makes building web applications simpler, faster and require less code. HTML - Hypertext Markup Language, a standardized system for tagging text files to achieve font, colour, graphic, and hyperlink effects on World Wide Web pages. PHP - PHP (recursive acronym for PHP: Hypertext Preprocessor) is a widely-used open source general-purpose scripting language that is especially suited for web development and can be embedded into HTML. CSS - Cascading Style Sheets (CSS) is a style sheet language used for describing the look and formatting of a document written in a markup language. AJAX - Ajax is a client-side script that communicates to and from a server/database without the need for a postback or a complete page refresh. Our solution works seamlessly on Windows and Linux based platforms. Our solution has been tested and is compatible to run on all three major browsers - Mozilla Firefox, Chrome and Internet Explorer. 'LITEROM' is developed with open end architecture having all possibilities for future enhancements. The solution can be upgraded easily with the upgrade of technology. 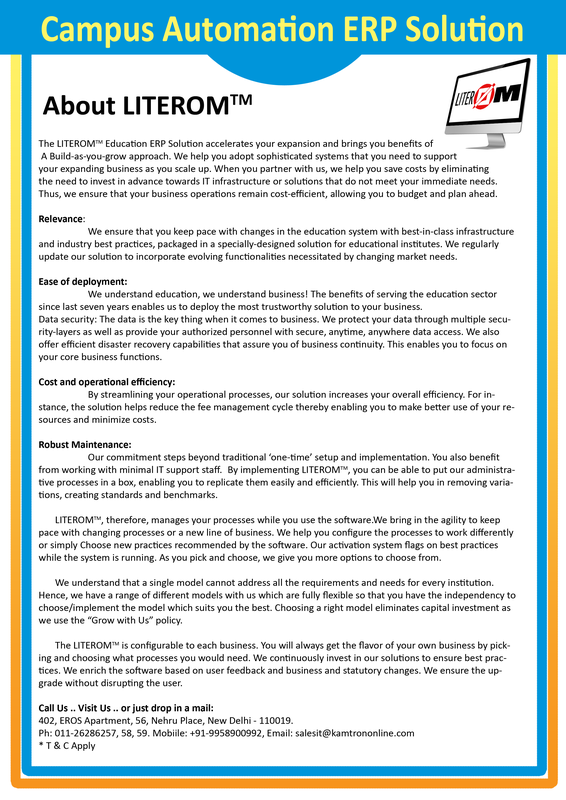 Our campus automation software offers a modular approach with robust capabilities focused on reducing costs, streamlining processes, and improving customer responsiveness across the enterprise-all top priorities toward achieving continued growth and profitability. MVC is Model View Controller. The MVC framework provides a clean separation of the UI, Business Logic, Model or Data. This not only allows faster development but also makes the solution very flexible, robust and secure. A single, end-to-end Campus Automation Solution is exclusively developed for the education industry. 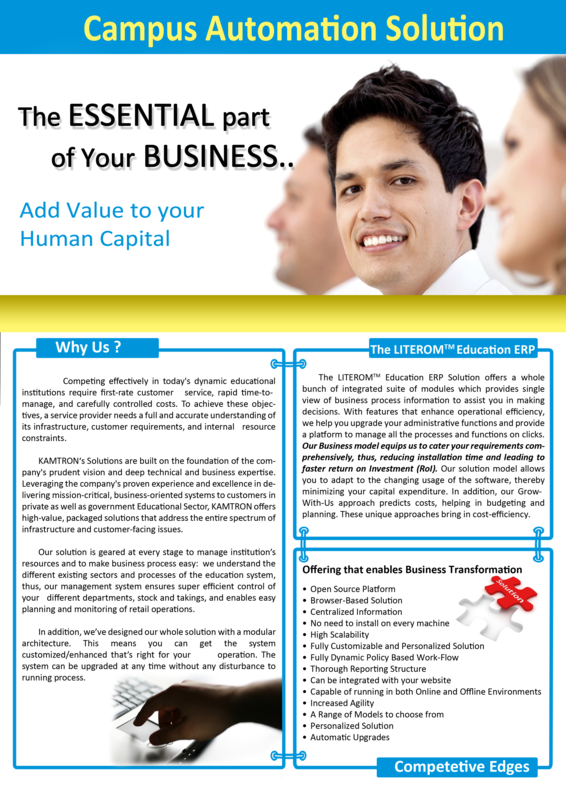 LITEROM is available on premise, hosted, or in the cloud as a software as a service (SaaS) solution. Our solution is built using 100% open source technology for better access and ease of working. Our Campus Automation Solution is developed and hosted on 100% license free platforms. Whether the Server OS or the coding technology or even the database it's all but free. Our clients do not need to pay a single penny to use them. The only cost which a client needs to pay is for the solution. Our Campus Automation Solution is 100% web based solution, which means, it does not need to get installed on each user pc to take use of it. Any user having proper rights and a valid user name & password can access and work on the system by using a standard browser (IE, Chrome & Mozilla). 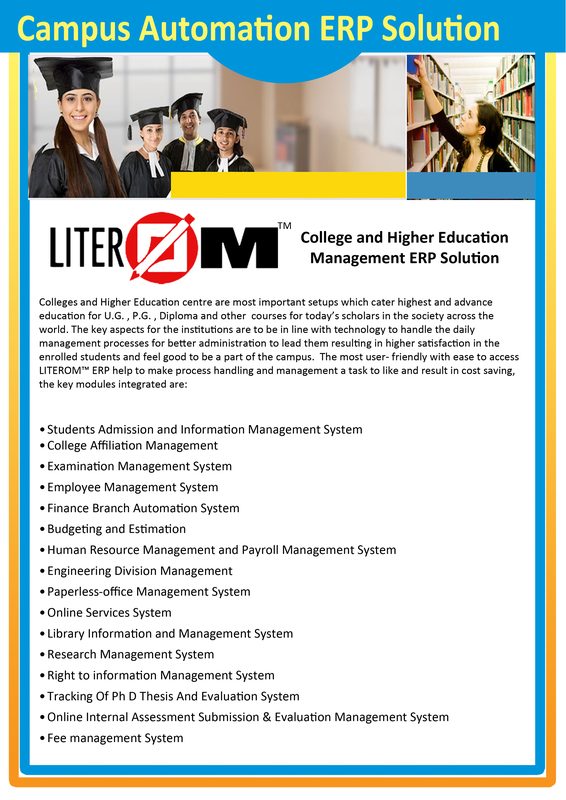 Our Campus Automation solution is completely roles and rights based. Therefore it becomes quite secure. The rights can be broken down to granular level of working in the system, hence, a user can be given module wise rights, transaction wise rights or a combination of both. This makes the administrator's job very easy. This white paper provides information and guidelines for maintaining the databases that host Microsoft SharePoint Products and Technologies data and configurations. It describes and provides examples of the database maintenance tasks that we recommend when using SharePoint Products and Technologies. It has been updated to refer to Microsoft SQL Server 2008. Cookies are used to maintain state information as you navigate to different pages on a web site or return to the web site at a later time. SharePoint sites can use either session or persistent cookies. This paper explains how to choose the appropriate approach for your sites. Search-first migration enables organizations that are using enterprise search in SharePoint Server 2007 to accelerate adoption of the search capability that is provided by SharePoint Server 2010. This document provides an introduction to search-first migration, an overview of the steps that are required to set up and use a search-first environment, and planning considerations for deploying and configuring a new server farm for a search-first migration. User guide for the SharePoint Diagnostic tool (SPDiag) version 1.0, which was created to simplify and standardize troubleshooting of SharePoint Products and Technologies, and to provide a unified view of collected data. DOC This document provides information, such as checklists for daily, weekly, and monthly tasks, which are related to the operations management of a Microsoft SharePoint Server 2010 environment. In addition, guidance is provided for using Microsoft System Center Operations Manager 2007 R2 to monitor a SharePoint environment.